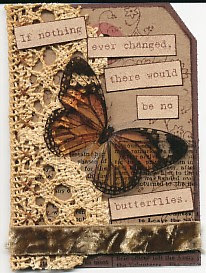 I had fun last night making ATCs for some swaps. This first one is for a one on one swap. Background is using my new justjohanna stamp ;) The lace is leftover from the torso that I made and was dyed with coffee. Butterfly was printed onto acetate and when not squished on the scanner, it's wings sit up like a real butterfly. The second one uses Big Al by justjohanna. I used the credit card technique for the background. Quote was printed on acetate and sewn on. Chipboard is brand spanking new small Botanicas by Buzz & Bloom (but with the flower heads cut off, lol), then a few little beads thrown in. These are awesome! I'm sure that your swap partners will love them. Ohhhh both so darn sweet--loving the owl Philippa! both are so unique.. I love the little owl very clever. 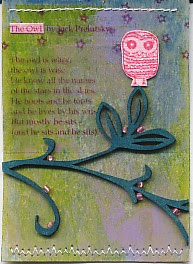 New Buzz & Bloom chipboard!